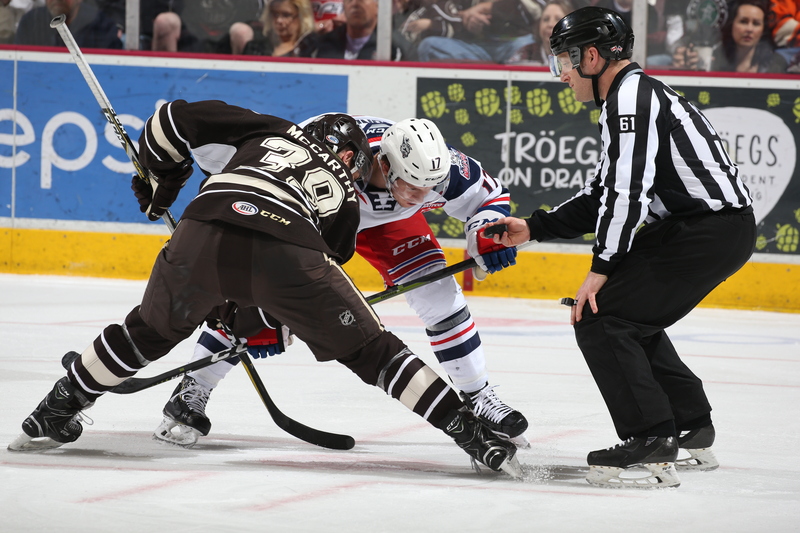 The Hershey Bears wrapped-up their 2018-2019 regular season schedule Sunday evening with a 2-1 win over the Hartford Wolf Pack. The Bears finish their 81st season with a record of 43-25-4-4 (94 points). Hershey begins their post season play this Friday when they faceoff against the Sound Tigers in Bridgeport in a best-of-five series. Scratches: Kris Bindulis (upper body), Garrett Pilon (lower body) and Riley Barber (upper body) were the injury scratches. Devante Smith-Pelly, Mike Sgarbossa, Jayson Megna, Tyler Lewington and Aaron Ness were all healthy scratches in the season finale. Suspended: Liam O’Brien was given a three-game suspension for his charging call in Friday’s game against Hartford. He will also miss the first game of the playoffs. Call-ups: Vitek Vanecek was recalled by the Capitals and Ilya Samsonov was returned to Hershey earlier in the day. Adam Morrison was recalled from the Carolina Sting Rays on Friday. The Wolf Pack would start the scoring with a tally just 32 seconds into the first period. Darren Raddysh would lace a shot from the right point that trickled between the pads of Ilya Samsonov. The Bears would answer with a goal from Chris McCarthy at 11:09 of the first period. Shane Gersich (16) and Joe Snively (4) had the helpers. The first period would end with the Bears and Wolf Pack tied 1-1. The Wolf Pack led in shots on goal 8-6 for the first frame. Both teams were 0 for 1 on the power play in the first period. The Bears would take their first lead of the game with a goal from Joey Leach at 5:04 of the second period. This was Leach’s first AHL goal. Joe Snively (5) and Chris McCarthy (2) were credited with the helpers. The second period would end with the Bears holding on to the one goal lead, 2-1. The Bears outshot the Wolf Pack 11-8 in the middle frame. Both teams were 0 for 3 on the power play after two periods. The Bears and Wolf Pack skated to a scoreless draw for a majority of the final frame. Joe Snively would add an empty net goal at 18:34 of the final frame. And that would be the final. The Bears outshot the Wolf Pack 15-9 in the final frame. With the win, both of the Bears goaltenders reach the 20-win mark for the season. Bears sweep season series with Hartford. Joe Snively had a goal and two assists. Chris McCarthy had a goal and two assists. Bears outshot the Wolf Pack 33-24 for the game. Joey Leach’s goal was his first in the AHL. 300th AHL game for Nathan Walker. The AHL box score for this game is here. This entry was posted in News and tagged Chris McCarthy, Hartford Wolf Pack, Hershey Bears, Joe Snively, Joey Leach, Jon Sorensen. Bookmark the permalink.